Alert Number Forty Four (#44) On Hurricane Irma Issued By The Bahamas Department Of Meteorology Sunday 10th September, 2017 At 3pm Edt. Irma Is Moving Toward The North Near 12 Mph And A North-northwestward Motion With A Further Increase In Forward Speed Is Expected Later Today, With That Motion Continuing Through Monday. On The Forecast Track, The Eye Of Irma Should Move Near Or Over Southwest And West Coast Of The Florida Peninsula Later Today Through Tonight. Maximum Sustained Winds Are Near 120 Miles Per Hour With Higher Gusts. Irma Is A Category Three (3) Hurricane On The Saffir-simpson Hurricane Wind Scale. While Weakening Is Forecast, Irma Is Expected To Remain A Powerful Hurricane While It Moves Near Or Along The West Coast Of Florida. Hurricane Force Winds Extend Outward Up To 80 Miles From The Center And Tropical Storm Force Winds Extend Outward Up To 220 Miles From The Center. Tropical Storm Force Winds Are Presently Being Experienced Over Bimini, West End And Freeport Grand Bahama And Is Expected To Continue Through Tonight. Residents In Bimini And Grand Bahama Are Asked To Remain Indoors During This Afternoon And Tonight As There Have Been Reports Of Tornadic Activities During Thunderstorms. Extensive Flooding Can Be Expected As Irma Could Produce Rainfall Amounts Of 2 To 4 Inches Over Bimini And Western Grand Bahama. Small Craft Operators In The Northwest Bahamas Should Remain In Safe Harbour. 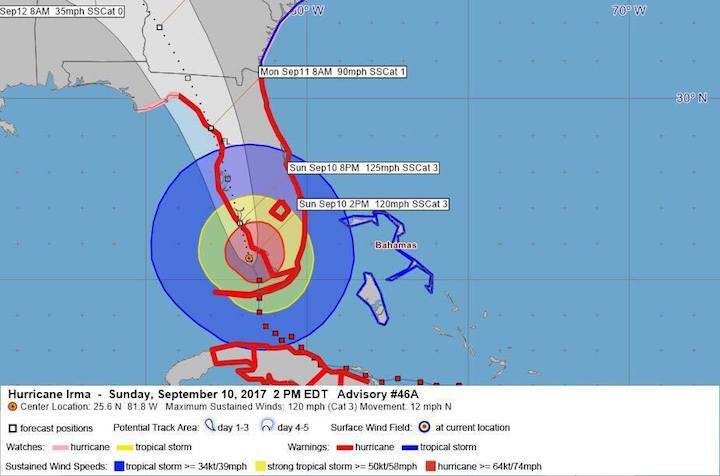 The Next Alert On Hurricane Irma Will Be Issued At 6pm Sunday.